Welcome to the photo gallery of the 13th Guards. In the gallery there are images of unit members taken at various events and shows both here in the UK and overseas since 2005 to the present. Please contact the unit CO, if a member has images that they would like to feature in the gallery pages. Battlefield tour to Russia 2006. In May 2006 the unit founder members travelled to Russia for a two week tour of famous battlefields and sites. The tour included visits to Moscow, Stalingrad (modern day Volgograd) and Kursk. We also had the privilege of having two Red Army veterans who fought at Stalingrad and Kursk also travel with us. Highlights of the visit included watching the Victory Day parade on Red Square, visits to Stalingrad and the Kursk salient, including Prokhorovka. There were numerous visits to museums about the Great Patriotic War, and including the huge tank museum at Kubinka. On the final day we had lunch at the Moscow Committee for Veterans of the Great Patriotic War. Operation " Spark " St. Petersburg, Russia. Operation " Spark " is a battlefield tour which also includes taking part in a commemorative re enactment of the breaking of the Siege of Leningrad, at modern day St. Petersburg. The visits coincide with the anniversary celebrations on the 27th January each year. The tour, which starts in Helsinki, Finland and takes in battlefield sites from the Winter War of 1939-40 and Continuation War of 1944 as well as the sites associated with the Siege. The highlight is taking place in the re enactment battle at the town of Nikolskoe, which is situated on the former southern defences of the city. Groups from Russia, Scandinavia, Europe and the UK take part in the re enactment, which is held on an actual battlefield and in the original trenches and bunkers still in existence there. The atmosphere is very realistic during the re enactment and is quite moving given its location. Members of the unit have attended Op. "Spark" in 2007,2008 & 2009 along with other UK groups. The local population, who appeared somewhat surprised to see British re enactors present, were grateful that were there to honour their own fallen during the war,and were very hospitable toward us. Lots of vodka of all round!!! Eden Camp and Murton Park, North Yorkshire. Eden Camp, near Malton in North Yorkshire is a former World War Two POW camp and is now operating as a museum and visitor attraction. Each spring, unit and NWW2A members attend the site for our pre season registration weekend. In December each year we also attend the site for our Association AGM and end of season social evening. 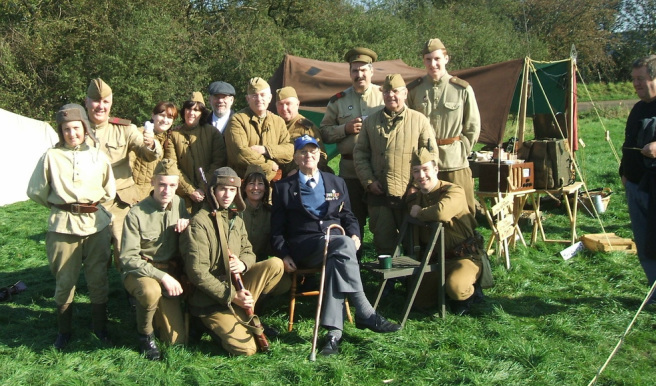 Members attend in period uniforms, with kit and weapons and enjoy attending Eden Camp and meeting members of the public for the first event of the new season. Murton Park, near York is home of the Yorkshire Museum of Farming, which is also an educational centre which covers subjects from the Roman occupation, Danelaw and Viking, Medieval to WW2 Home Front periods. Each spring the unit undertakes a closed members only pre season training weekend. We spend the weekend doing refresher training and preparing for the new re enacting season ahead. We are extremely grateful to the proprietors of both Eden Camp and Murton Park for the use of their facilities. In June 2010 members from 13th Guards together with re enactors from other groups undertook a climb of Helvellyn in the Lake District. The climb was sponsored in aid of the Ghurkha Welfare Trust to provide support for Gurkha veterans and their widows in Nepal. The event unlike previous years was blessed with glorious weather and beautiful views. Our thanks go out to all those who supported us to raise funds for this very worthy cause. Members of 13th Guards together with our Comrades of 2nd Guards Tank Army and "Club Division", Moscow at the War & Peace Show 2011. The photograph is by John Blackman. The image is reproduced with the kind permission of John, Editor of the Classic Military Vehicle magazine. The War and Peace Show 2011, Beltring, Kent. Since 2006 members of 13th Guards have attended the War and Peace Show in Kent each year, as guests of our comrades of the 2nd Guards Tank Army. The show is the largest of it kind in the world with military vehicles of all periods present from around the globe. There is also a large attendance of re enactors covering various periods of the 20th Century. 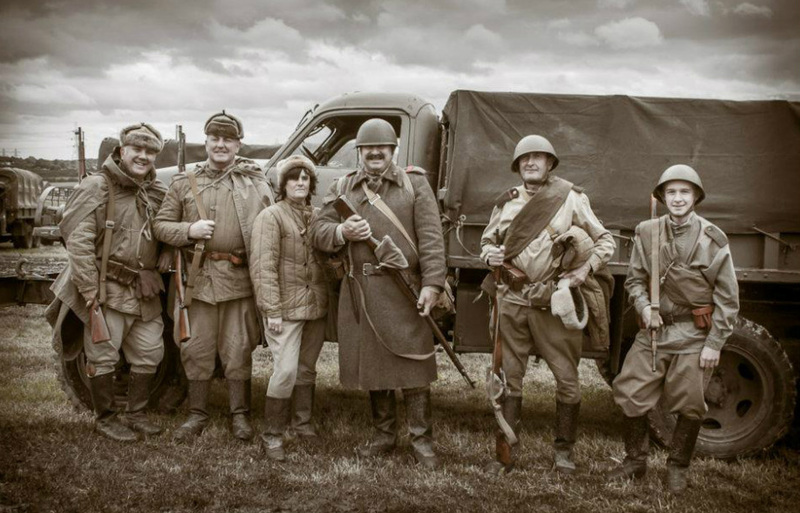 In 2011 we were joined by a group of re enactors from "Club Division" all the way from Moscow. Also, at the show members had the privilege of meeting with Helen Patton, grand daughter of US General George Patton and also original "Band of Brothers" members, Don Malarkey and Earl McClung, of Easy Company, 506 P.I.R, US 101st Airborne fame, and were able to obtain their signed autographs! It was a fantastic week meeting some great people and it turned out to be the best show we have attended. The images were taken during the course of the show and include members from 2nd Guards Tank Army, Club Division, 13th Guards, 2nd Guards and friends and during walk through rehearsals for the skirmishes with Das Reich of W.A.R.S. War and Peace Show 2011. 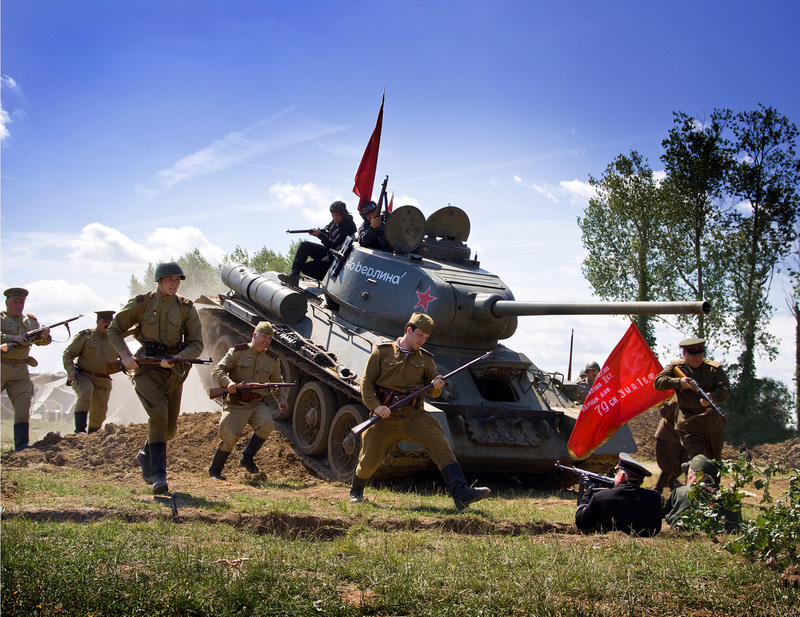 More images taken at the 2011 of our Comrades from 2nd Guards Tank Army and Club Division, Moscow. Our thanks go out to Elmira Watts Photography for providing many of the images shown here. Thanks again Elmira. Military Odyssey 2011, Detling, Kent. Detling is the largest multi period event of it's kind, drawing re enactors of all periods from around the world.In August 2011 members of 13th Guards attended the Military Odyssey Show as guests of 2nd Guards Tank Army, our first official attendance. Whilst at the show we joined our comrades from the 2nd Guards Rifle Division, Ispanients (Spain) and invited guests on the battlefield arena. Each day members took part in the Eastern Front scenarios, which involved several period vehicles on each side and with fly passes from Soviet aircraft. Well over fifty Soviets re enactors were fielded each day for the battles. Thanks go to our Comrades in the 2nd Guards Tank and Rifle Division respectively for allowing our participation in what was a great event. Below is a medley of images taken at various unit event of recent times. The venues also include Beltring, Fort Paul near Hull, Sheffield, Elvington near York, Northallerton and Crook Co, Durham and RAF Waddington near Lincoln. We are dedicated re enactors and enjoy interacting with and educating members of the public about the Red Army and the Great Patriotic War. However, it can also be seen we have a social element to our unit after the public have gone home. Unit meals are cooked on the camp fire, a few drinks, some music or a musical instrument may even appear and some communal singing to end the day on! 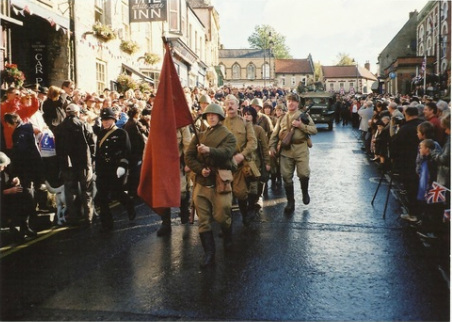 Each October the North Yorkshire market town of Pickering hosts it's wartime weekend, in conjuction with events on the North Yorks Moor Steam Railway. During the weekend thousands of visitors attend the town and railway for the World War Two commemorations and evening functions. Hundreds of re enactors and numerous period vehicles, both military and civilian take part in the parade through the town on the Saturday morning. In recent years, the Northern World War Two Association have put on living history and battle re enactment displays at the Pickering Showground on the outskirts of the town. Pickering 2010. Parade through the town centre. Pickering 2011. Larry, with his son Mike (far right) and members of 13th Guards. Attending events such as Pickering, we always look forward to meeting the veterans. We had the pleasure and honour to meet World War Two veteran Larry, aged 89yrs from Stokesley. Larry recounted his wartime Special Forces experiences, which included the Dieppe Raid in 1942 with Canadian Forces. In May 1944 the Lancaster bomber he was flying in was shot down over France and he was seriously injured after bailing out. He was cared for by the French Resistance and after he recovered from his injuries, he fought with the Resistance until the end of the war. He is the holder of the French Croix de Guerre decoration as well as several British war and campaign medals.. The Yorkshire Wartime Experience. 13th Guards with Studebaker US6 truck at a very wet and windy weekend in West Yorkshire, June 2012. Image courtesy of Nicky Heppenstall. The images here were taken at the Pickering Wartime Weekend in October 2012. Pickering 2012, 13th Guards with British WW2 veteran. Visit to Moscow May 2012 for Victory Day commemorations. Members of 13th Guards together with comrades from 2nd Guards Tank Army visited Moscow, which was hosted by our comrades Club " Division". During our week long stay we saw the full Victory Parade rehearsal on Red Square and visited the Kubinka Tank Museum. We took part in the actual Victory Day commemorations on Poklonnaya Gora and we were also given the honour of placing a wreath at the site of the Eternal Flame whilst there. We also took in visits to the Museum of the Great Patriotic War and the Central Army Musuem as well as many of the well know sites in the City. Our gratitude goes out to all the members of Club " Division" who hosted our visit and made us very welcome and spoiled us with their overwhelming hospitality.During our visit Club "Division" Moscow were officially invited as honorary members of the 13th Guards. The Yorkshire Wartime Experience July 2013. The YWE was held at Hunsworth near Bradford, West Yorkshire in early July 2013. Last years show was cancelled due to very poor weather conditions. However, this years show was blessed with hot sunny weather, which brought out the public in large numbers. Over 300 military vehicles and 50 re enactment groups were booked into the show, including WW1 & WW2 groups. The show was also the first public event for the units T34/85, which was greatly received at the show. The War and Peace Revival Show, Kent 2013. The 13th Guards made its annual visit to the show at its new venue at Folkestone Race course as guests of 2nd Guards Tank Army. The unit was accompanied by the 13th Guards Tank Brigade T34/85. Unlike last years show, we were blessed with hot sunny weather and met up with many friends and veterans from previous shows. Unfortunately, we were not joined by our comrades from Club Division, Moscow this year, because of their own domestic commitments. We hope that they will join us again at the show sometime in the future. Rufford Abbey, the Victory Show and Rauceby Wartime events. In September 2013 members of 13th Guards together with the T34 tank were invited to attend events at Rufford Abbey, Nottinghamshire and the Victory Show in Leicestershire. Rufford Abbey was a Home Front living history event, where the unit represented a Soviet wartime delegation to raise war aid for the Eastern Front. The T34 and our display was greatly appreciated at Rufford. The following week we were at the Victory Show, again living history with the T34 together with our comrades in 2nd Guards Rifle Division. We had the opportunity to demonstrate the T34 in the public arena, with tank riders from 2nd Guards. Thanks also go to John Mackaill for the kind permission for reproducing his images from both events on our website. The 13th Guards have also attended the Rauceby Wartime Weekend in Lincolnshire in recent years, attached are images taken at the 2015. Elbe Day Torgau Germany 25th April 2015. Members of 13th Guards travelled to Torgau for the 70th Anniversary of the meeting of the Allied and Soviet Forces on the River Elbe in April 1945. On the outward and return journeys, members visited historical sites such as the Mohne Dam, Colditz Castle and Arnhem. During our week long visit we were hosted at the Militarhistorische Rad- und Kettenfahrzeuge Military Vehicle Museum in Torgau and met other clubs from Russia, Belarus, Poland and Germany. We took part in the commemorations on the River Elbe in Torgau on 25th April and also visited nearby Muhlberg, where the 13th Guards Division were on the River Elbe on the 24th April 1945 and the site of to POW camp M. Stammlager IV B, one of the largest POW camps in Germany during the war. Members were also presented with 70th Anniversary commemorative medals of the meeting on the Elbe by Army General Ermakov, from the Organisation of the Veterans of the Armed Forces of the Russian Federation. Members also received diplomas for work in promoting friendship and medallions from the "Spirit of Elbe" organisation. Our special thanks go to Gerald Ermel from the Military Vehicle Museum in Torgau and Sergey Larionov from Club Division Moscow for hosting our members. During the visit to Torgau 13th Guards members visited the town of Muhlberg, which is situated about 15km south east of Torgau on the River Elbe. The 13th Guards, 32nd Guards Rifle Corps, 5th Guards Army were present in the area at the River Elbe on the 24th April 1945 when the town was captured. A visit was made to the site of the POW camp M. Stammlager IV B, one of the largest POW camps in Germany during the war and was liberated by the Red Army on the 23rd April. The camp later became the Soviet NKVD Special Camp No1. The associated camp cemeteries were also visited in nearby Neuburxdorf. A trip to the famous Allied POW camp at Colditz was also made. Crowle & Ealand, North Lincolnshire 2016. In late September 2016 members attended a newly established wartime weekend event held in the villages of Crowle and Ealand, where we provided a living history display of wartime Soviet weapons, equipment and personal items. It was very well supported and attended by the local community who got into the spirit of the event. It was an enjoyable weekend and the event has great potential for the future. Next year we hope to attend with the T34 and other vehicles. Loch Ewe Festival 6th - 7th May 2017. A view of Loch Ewe at Poolewe looking west. The 13th Guards were privileged to be asked to take part in the 75th anniversary commemorations of the commencement of the Allied convoys to Russian during WW2. The Festival took place in the communities of Poolewe and Aultbea on Loch Ewe, Wester Ross, in the Highlands of Scotland, where the convoys assembled for the perilous journey by sea to take war materiel to Murmansk and Archangel in artic Russia. The event was supported by the Russian Artic Convoy Museum Project and attended by local dignitaries, representation from the Russian Embassy, Edinburgh, veterans of the respective Arctic Convoy Associations from the UK, Canada, USA and the Russian Federation. The sail training ship ' Young Baltiets' from St Petersburg put in at nearby Gairloch with a crew of young cadets for the commemorations. During the Festival, a new Arctic Convoys museum was opened in Aultbea, a service of rededication took place at the Convoys memorial at Cove on the headland at the entrance of Loch Ewe as well wartime themed events within the local communities. Sadly, because of old age and infirmity of veterans, the event was the last to be formally represented by the Convoy Association. Given the resolve of the veterans though, no doubt those who are still able to attend will do so privately in the future. The group took along the T34 tank and GAZ 67 utility vehicle and provided a living history field display on the loch side in Poolewe and were welcomed by the local communities. The event was blessed with unseasonal good weather and was very well attended by locals and visitors alike. There were a number Russian expats who live in the area came along and even a twelve car convoy of expats of the former USSR, now living in Glasgow made the journey to Loch Ewe. Members also took part in TV coverage of the event, some of which was aired in Russia by NTV and RT respectively. "You and your friends made it really atmospheric. I was charmed by the whole campsite, Russian buckwheat, the way you were talking , singing Katusha and wearing the Soviet uniform, all touched me deeply". "It was nice meeting you all at the Loch Ewe WWII Festival and well done for what are you doing. Your exhibits and knowledge of Russian language and culture are very impressive." This is a transcript and translation of a recent interview by the Pulse UK newspaper (a publication in Russian for Russians living in the UK) with a Russian veteran of the Arctic Convoys who attended the weekend at Loch Ewe 06-07 May 2017. The leader of the group, Combat Veteran Lt-Col Aleksandr Ivanovich Goncharov, gave the following account about the trip to Scotland. “We were really lucky – the weather was excellent and the whole two days, you might say, passed as if in a single moment. The organisation was faultless, we received a warm welcome and went away with a lot of impressions. The representatives of military-historical groups performed outstanding work, exhibiting as they did actual restored military hardware of that period – a T-34 tank with working motor and an 85mm gun, German Messerschmitt, British aircraft, flypasts by a genuine Spitfire – a British fighter aircraft of WW2. All this created an unforgettable atmosphere. Above all this touched the hearts of the veterans because for them it was an encounter with their younger days. They saw the military equipment with which they worked and on which they served. Amongst the five men who were there were a cavalryman, a signaller and a bosun. Our veterans revisited their youth in spirit and in body, utterly absorbed in the atmosphere of their younger days which were so much affected by the war”. We also wish to extend our gratitude to the proprietors of the Inverewe Gardens Camping and Caravanning Club Site for the kind use of their facilities during the Festival. Thanks also go to Elena Reid (EKR) for kindly forwarding images of the event and allowing their use on our website.